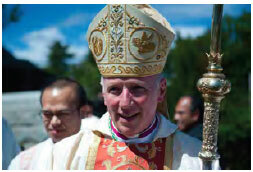 Home » Latest News » Welcome, Bishop Les! The Sandhurst Diocese warmly welcomed newly appointed Bishop Leslie Tomlinson DD at the installation Mass held at Sacred Heart Cathedral in Bendigo on March 1st, 2012. Around 1500 people filled the Cathedral coming from all areas of the diocese.